Perspectives on the World Christian Movement (Perspectives) is a fifteen week course about the global purpose of Christians, designed around four vantage points or “perspectives” – Biblical, Historical, Cultural and Strategic. The course has the objective of opening the eyes of Christians to the vision that God has a “world-size” role for every believer in His global mission. The point of this course is to simply show practical examples of how missions can be done wisely and well, against the background that God will fulfill His promises. Declare His glory among the nations, His marvelous works among all the peoples! (Psalm 96:3). 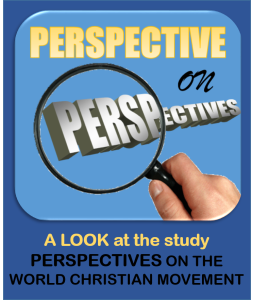 I have embarked on the Independent Study Online format of the Perspectives study program and will periodically share a perspective on different lessons. Lesson 3, Your Kingdom Come, presented Jesus’ mission, prayer as a tool, the hope and focus of the church and the Kingdom of God as everywhere where God is reigning and ruling. Shall we look for another? – In Matthew 11, from prison John the Baptist sent messages to Jesus asking if he was really the coming One. John was looking for a great military leader who would separate the wicked to destruction and gather the righteous in the “new Kingdom”. The Kingdom of God was indeed with Jesus, but instead of destroying human sovereignty, it attacked the ruling power of Satan. Jesus’ words and actions declared that with His coming was a time for healing the downtrodden and preaching the gospel to the poor. Prayer against the status quo – John Robb (author in Perspectives on World Christian Movement) says that Idolatry and strongholds often dominate the least evangelized settings. Idolatry usually enmeshes people into contracts with false gods, while Strongholds are false patterns of thought. Prayer is very significant to the opposition of the status quo of idolatry and strongholds. The least Idolatry and stronghold the more of God’s glory would be in that area. 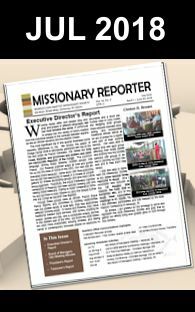 The general mission is to bring God’s glory to all the earth so prayer is important to the fulfillment of the mission. Before the End – “And this gospel of the kingdom will be preached in the whole world as a testimony to all nations, and then the end will come” – Matthew 24:14. In this passage Jesus gives His disciples a specific description of what must be accomplished before the world, as we know it, ends. World evangelization is an explicit condition for Christ’s return. The good news of the kingdom of God must be preached by the church in all the world for witness to all nations and then the end will come. This declaration by Jesus does give hope and focus to the Church. Within this statement is the confidence that despite the many challenges, with Jesus having the authority leading, the good news will reach all nation in a way for them to understand and appropriately respond. Then the world of sin, idolatry and strongholds will end and we will reign with Him. Lesson 3 for me confirms the Kingdom of God as everywhere where God is reigning and ruling, Jesus as the Messiah and the value of prayer as rebellion against status quo. Matthew 24:14 give the church hope and focus for the mission. I am motivated to live in hope, “since lives lived in hope can face great evil with relentless courage.” – Looking forward to the next lesson.